Violet and Charlotte are two key characters on Private Practice. They're played by Amy Brenneman and KaDee Strickland, respectively. Caught red handed? Here's a cool photo of Addison Montgomery in "Serving Two Masters" from the second season of Private practice. Addison Montgomery in "Serving Two Masters" from the second season of Private Practice. 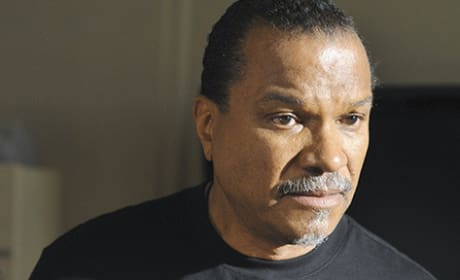 Billy Dee Williams guest stars on the November 19, 2008 episode of Private Practice, "Serving Two Masters." He's awesome. Looks like Addison Montgomery will have her hands full in "Serving Two Masters," from the second season of Private Practice. Addison: I think I may have gone too far. Naomi: What do you mean you followed him? Addison: At first it was just a routine surveillance. Naomi: You are not a cop! Addison: I followed him to work, to the precinct which is apparently where I should have stopped. Naomi: Oh, God. Where - where are you now, crazy woman? Addison: I'm not insane. I went to the precinct. Five minutes later he comes roaring out of the parking garage in another car, a van. Naomi: Dit it - dit it not occur to you that he might be working? Addison: Of course he could be working. Only maybe he's not working. People lie. They lie and they cheat and they ruin people's lives and I'm not gonna be one of those women who gets dumped. Addison: Or maybe he's working. Pete: I am thinking we should hit a bar tonight after work. Try again. There are so many beautiful women in L.A..
Pete: Sam! Cooper is dating! Sam: Cooper is dating the antichrist! Pete: Well... At least he is dating.